ESPN anchor Stuart Scott dies of cancer at 49. 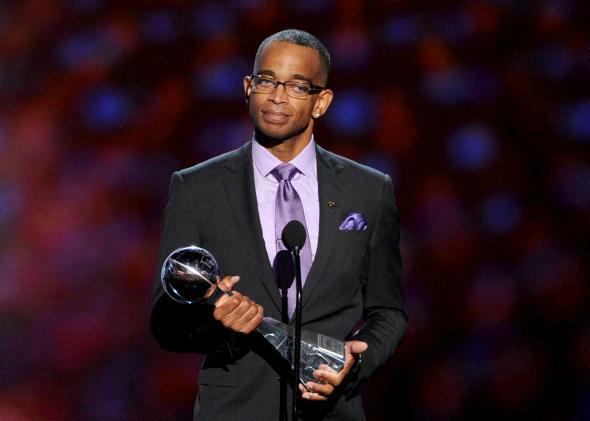 Stuart Scott accepts an award at the 2014 ESPYS in Los Angeles. Longtime ESPN anchor Stuart Scott died Sunday after years of living with cancer. Scott was “the sports broadcaster that an entire generation of aspiring broadcasters wanted to be,” as CNN describes him. Yet most recently, Scott was also an inspiration for the way he talked about his “fight” with cancer. Although he was initially very private about the disease, which was first diagnosed in 2007, he became increasingly public with it. Scott really opened up in July, when he received the Jimmy V Award for Perseverance at the 2014 ESPY Awards and got a standing ovation. “When you die, that does not mean that you lose to cancer,” Scott told the audience. “You beat cancer by how you live, why you live, and in the manner in which you live.” At the time, Eliza Berman wrote in Slate that the most inspiring thing about that speech was how Scott picked apart the clichés about how those who have cancer are taking part in a heroic battle. “When you get too tired to fight, then lay down, and rest, and let somebody else fight for you,” Scott said. *Correction, Jan. 5, 2014: This post originally misstated Sydni’s age.